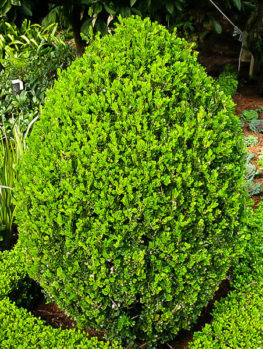 The Green Gem Boxwood has been specially bred and selected to grow into a dense ball with no clipping. It has also been developed to be extremely winter hardy, staying green and healthy even in cold areas. It will not turn bronzy and die back, as common boxwoods will north of zone 6. This sturdy hybrid plant will naturally grow into a sphere that is 3 to 4 feet across and tall, with no need for clipping. Even if you feel the need to clip for the neatest look, the natural shape makes that easy. Since it stays quite small, it is ideal for a pair of shrubs in attractive pots to frame a doorway, or to grow in groups of three or five among the foundation planting around your home. It can be dotted along a driveway, planted around a bed, or used anywhere you want the touch of a rounded accent plant. The Green Gem Boxwood will grow well in any soil that is not constantly wet, and it thrives anywhere from full sun to almost full shade. In hot areas, some afternoon shade is beneficial, and in very cold areas shelter from cold winds is appreciated too. 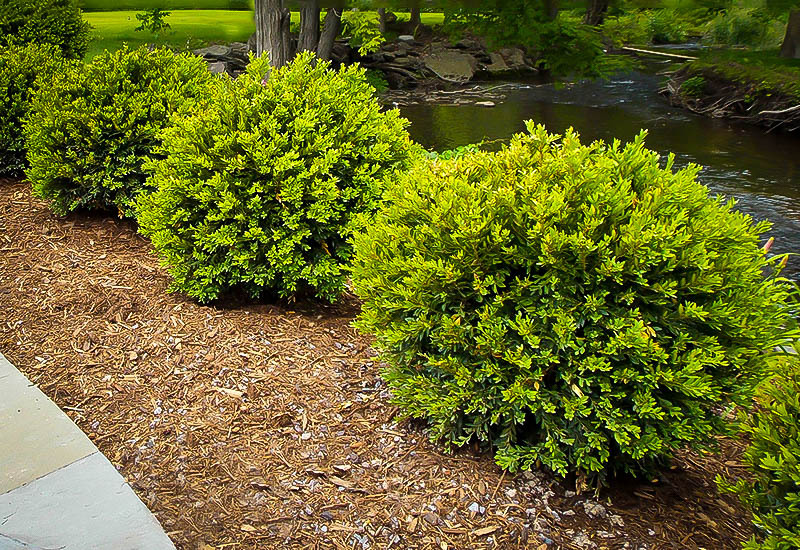 Even in the coldest places this shrub will not turn bronzy, or die back, making it the perfect choice if you have tried boxwood before, and had it killed in winter. It is also normally pest and disease free, and deer not to graze it either in normal winters. 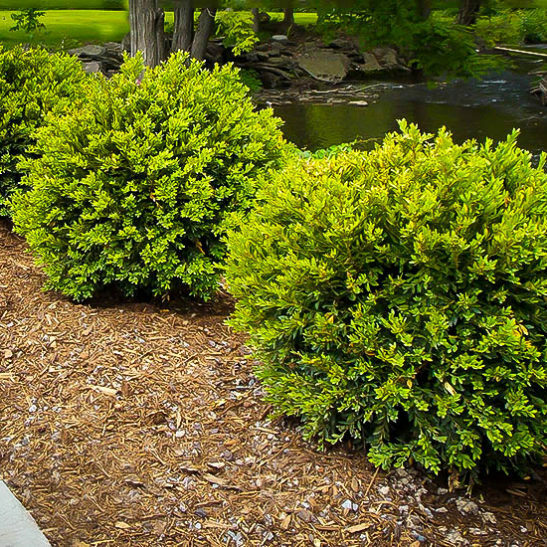 For an easy to grow rounded accent, you need look further than the Green Gem Boxwood. 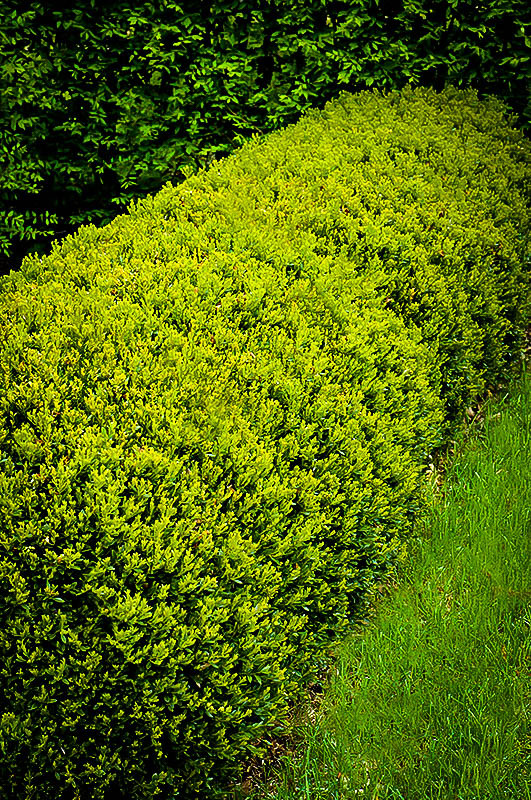 Boxwoods are everyone’s favorite when it comes to low hedges and accents around the garden. Especially in a more ‘formal’ garden, but really, also attractive in any setting, boxwoods are garden staples that bring structure and form, visually ‘taming’ the wilder and more rampant plants around them. Unfortunately, when the early settlers brought boxwoods with them to the early United Sates, they quickly discovered that the harsh climate was not to their liking. 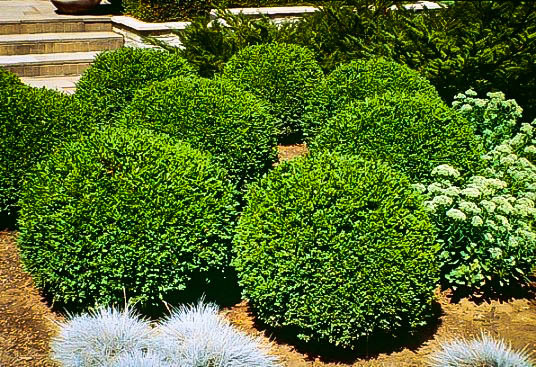 Ever since that time, American gardeners have craved hardy boxwoods, at least they did until the Sheridan Green Series was created in the cold Canadian provinces by Sheridan Nurseries. Top spot in the Series must go to the Green Gem Boxwood, because it solves not one but two of the biggest objections to growing boxwood. It is super-hardy, surviving even up in Canada and keeping its healthy, rich-green foliage all winter long. While most other forms turn bronzy-brown and suffer die-back of the branches in zones 4 and 5, not the Green Gem Boxwood, which stays fresh and green year-round. The second great thing is that this plant needs little or no clipping to develop into an almost perfect round ball, 2 to 4 feet across and wide. Especially in a more relaxed garden, unclipped plants are perfect – dense, rich-green and neatly rounded. 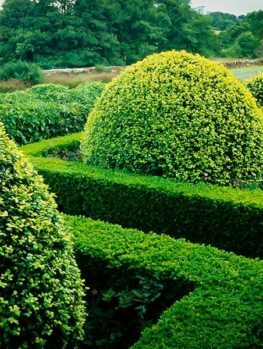 Of course if you wish you can clip this plant as often as you wish, to keep it a perfect sphere, and with such a neat grower, most of the work is already done for you and you just need a trim to keep the Green Gem Boxwood super-tidy. 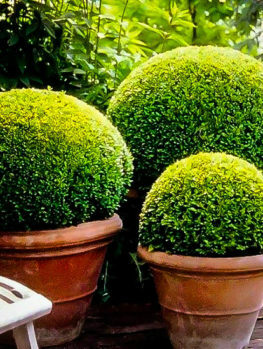 The Green Gem Boxwood grows between 2 and 4 feet tall, and it naturally stays the same across – an almost-perfect sphere. As well, this hybrid plant combines the American boxwood with the hardy Korean boxwood, producing a plant that is good looking, but also hardy like its Korean parent. 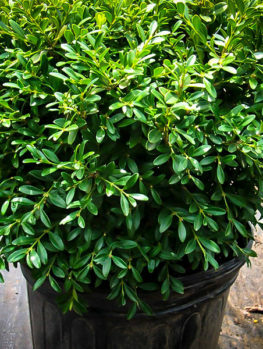 This doesn’t mean the plant is only valuable in cold areas, because it is still a top choice for an easy-care spherical boxwood of medium size, all the way into zone 9, which covers almost all the country. No matter Where you live, this plant is a great boxwood choice. 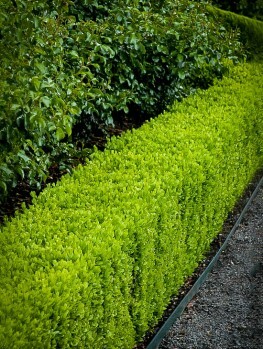 The Green Gem Boxwood can be planted in almost all light conditions, from full sun to almost full shade. Avoid very dark places underneath low trees, and in hotter areas some midday and afternoon shade is appreciated, as that will keep your plants a rich, dark green. This plant grows in every soil-type, from sandy soils to clay, as long as it is not in soil that is always wet and boggy. Enriching the soil with organic material before planting will get your shrubs off to a great start, and a regular program of watering and fertilizing will give you maximum growth and perfect health. This plant has few significant pests and diseases and it is usually avoided even by deer. Trimming can be done throughout the growing season, from spring to early fall, but avoid clipping in winter, especially if you live in a cold area. More than anyone else in North America, Canadians know how to garden successfully in cold conditions, so it was natural they would take up the challenge to develop better boxwoods for America. Plant breeders at Sheridan Nurseries, in Ontario, a long-established family business, decided to tackle the problem of creating hardier boxwood plants. Starting in 1955, they took a batch of seedlings from a cross between the English and Korean boxwoods, and carefully tested them for form and hardiness. One – soon to be called ‘Green Gem’ – had a remarkably neat, rounded form that caught the breeder’s attention. 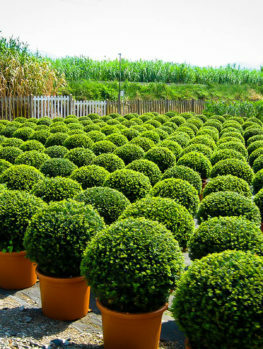 It was released in 1973, and is renowned as the top choice for a natural ball-shaped boxwood, especially in cold climates. Other boxwoods in the series, such as Green Mountain, are also among the best boxwoods for colder climates. With so many different forms, and the climatic challenges they each can face, cheap seedling boxwoods that have not been especially selected and carefully tested for hardiness will simply not give you the results you need, and be a great disappointment. Here at The Tree Center, our plants are exact duplicates of that original tough plant, and they are grown from selected stem pieces that are carefully rooted and grown under controlled conditions to be the best possible specimens available. 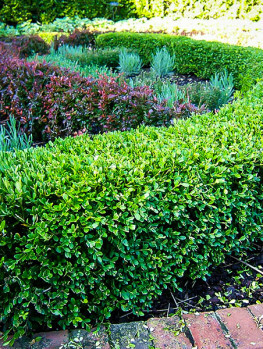 Because of its unique combination of cold-hardiness and rounded shape, the Green Gem Boxwood is always in high demand. We have a good supply of top quality plants, so that we can send you the best plants available. However, such a top-selling plant can be in short supply, so order now to avoid disappointment.